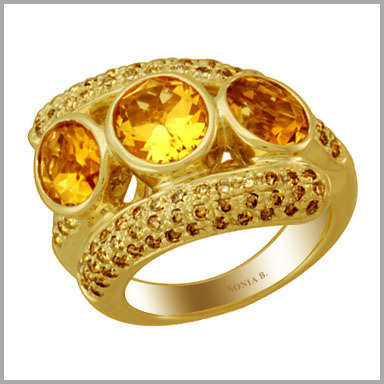 14k yellow gold bypass ring, beautiful combination of oval citrines and pave setting diamonds. A striking combination of gemstones and diamonds! This bypass style ring is created with polished 14K yellow gold and features two oval 6x8 & one oval 7x9 citrines in bezel settings,and 93 round full cut diamonds in pave settings The total citrines weight is 3.9600ct and the diamond weight is 0.465ct (all approximate). Diamond color is G-H and clarity is SI2.